We are just about coming to the conclusion of National Breastfeeding Month and I hope you have all enjoyed the giveaways and stories as much as I have. I still have a few more posts to put up that may spill over into next month so stayed tuned for more fun. Today, we have a guest post from Anna, who really loves nursing her almost two year old daughter. My baby is turning 2 next month, and I am surprised, excited, and proud to say that I am still exclusively breastfeeding her! I honestly did not know much about breastfeeding before having my daughter and didn’t really care to know anything. I just knew two things: I wanted to try to breastfeed her until she was at least 3 months old, and I didn’t want to be one of those weirdos who breastfeeds their toddler! Who does that!?! Well, I do—that’s who! 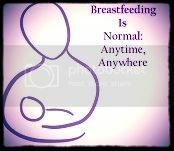 Being able to breastfeed my daughter has been one of the greatest gifts that God ever gave me. It has contributed to an indissoluble bond between us that I believe will stay strong till the end of time. I promote breastfeeding not only for this bond and for the unbelievably amazing, natural nutrients, but because it makes you stop and enjoy your time with your child. There’s really no way to rush a breastfeeding session. You must pause, sit, and look down into your baby’s eyes. . . and smile. Then, as she got older, I also learned ways to multi-task while breastfeeding! At least 75% of my emails sent are with my daughter suckling away in my lap as I communicate with clients. Who knew this was possible! However, I still sit down several times a day with her in my lap and focus on her as she nurses. Just us, mother and daughter. It teaches me to slow down and enjoy the time I have with my baby. I am not a die-hard advocate of breastfeeding, nor do I think it’s always the best way to care for one’s baby. I am just a mom who has had an amazing time breastfeeding my daughter for the past 2 years and watching her grow bigger in my arms each month. People ask me when I plan to stop breastfeeding, but I don’t have an answer. When it feels right, when we are both ready to move on, then we will. Until then, I will continue to cherish these sweet moments I get to have with her, because, before I know it she will be in high school, and, no, I don’t plan to be breastfeeding her in high school. Anna is a single mom who lives in Tampa and works full time from home for a process serving company. She has one daughter who will be two in September. She is passionate about fitness, boxing and keeping both herself and her daughter on a Paleo/Primal eating plan. Does your baby eat any solids? Nursing In Public: Just do it!